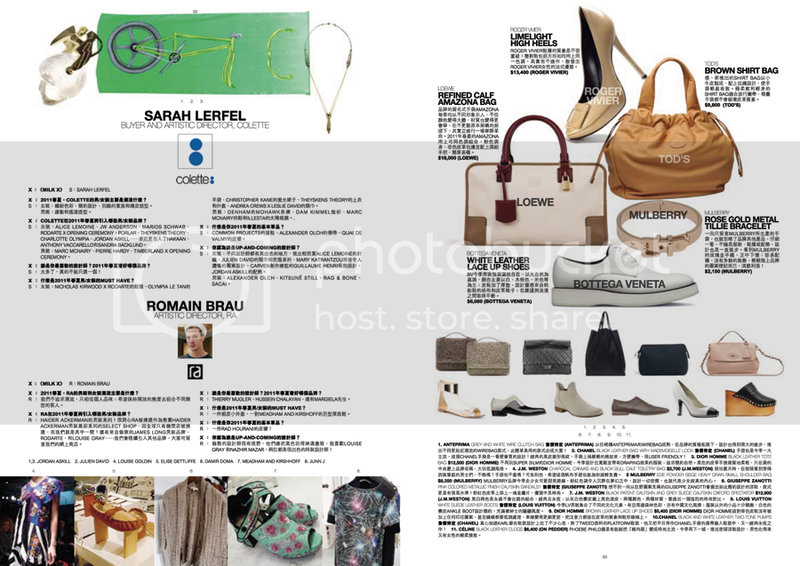 So honored that I was asked to give my insights about upcoming Spring Summer 2011 trends in Milk X magazine among Maria Luisa, buyers and artistic directors from Colette, Opening Ceremony, Net-a-Porter, Beams and bloggers Bryan Boy, Jenn Camp from Le Fashion and Kimberley Brandsma!! 1. 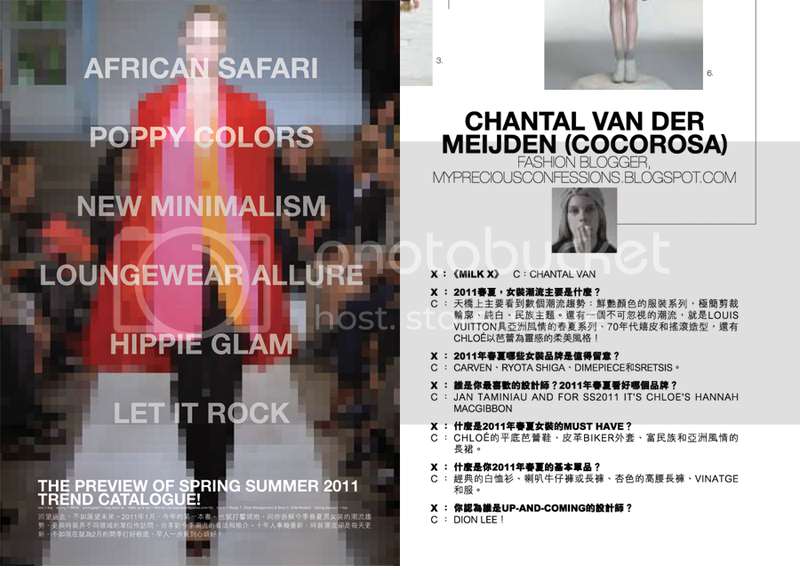 What are the trends in coming 2011 S/S? On the runway we saw a lot of optimistic bright and vivid colors, minimalistic silhouettes, clinic whites and various ethnic themes. Other trends that absolutely can’t be underestimated are the Asian themes as seen in Louis Vuitton, 70’s themes with flare and wide legged jeans (also seen with a rock n’ roll attitude) and Chloe’s ballet theme. 2. Any new brands in 2011 S/S? 4. 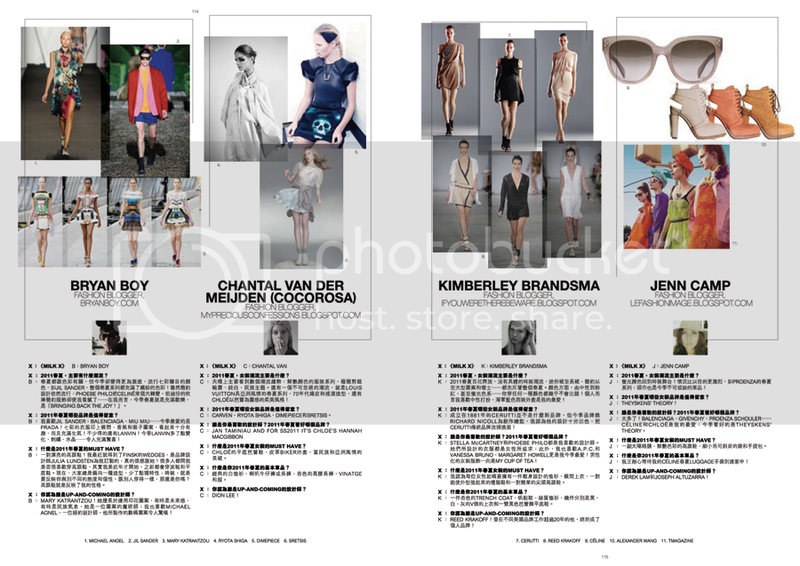 What are the fashion items a woman should possess in 2011S/S season? A classic white shirt, flared jeans and pants, classic beige colored high waisted shorts, vintage reworked kimono’s. 6. In your opinion, who is the up-and-coming designer? Amazing feature, congratulations on the wonderful article! I’m so excited you mentioned Dion Lee as the up-and-coming designer, it makes me proud to be Australian, hahaha. Congratulations! That is so exciting, keep up the awesome work! that is so cool! ill keep an eye on the designers you mentioned as well. Great feature!! Thanks for sharing!! I like what you put, I am already grabbing some bell-bottoms for spring! Congratulation I’m very happy for you! Nice chantal! I love your blog and how different it is! I love these photo collections. and congrats on your feature! Nice feature! I’m reading the Chinese part, haha. wow! congratulations on the feature. Good Job, you!